Composite materials are heterogeneous materials composed of at least two integrated components. Among the different types of composite materials, layered composite materials are quite common and are widely used for aircraft, spacecraft, wind turbine, automobile, marine, buildings, and safety equipment use cases. 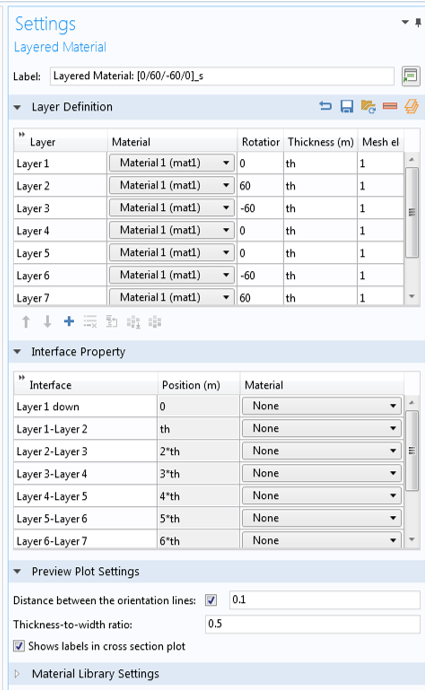 The Composite Materials Module, add-on to the COMSOL Multiphysics® software, includes built-in features and functionality specifically designed for studying layered composite structures. Fiber-reinforced plastics, laminated plates, and sandwich panels are a few common examples of layered composite materials. Composite materials are stronger and lighter than conventional materials, which is why they have many potential use cases in diverse areas. For instance, some industries are developing “smart” composite materials, which could have sensing, actuation, computation, communication, and other functionality. Before it’s possible to design composite structures out of these materials, though, engineers must have a good understanding of their behavior. Based on the reinforcement shape, composite materials can be classified into fibers, whiskers, and particulates. Examples of fiber, whisker, and particulate composites. Since composite materials are manmade, there are also some challenges involved with using these materials. Some examples include the high cost of raw materials and fabrication, difficulty in reuse and disposal, difficulty in joining different components, and various types of failure modes. They also involve anisotropic materials, hence they are challenging to analyze. Among other composite materials, fiber-reinforced plastics (FRPs) are quite popular these days. These materials typically consist of a fibrous part, which acts as the main load-carrying element, and a surrounding matrix/resin, which supports the fiber and transfers the load. The fibers are arranged in a specified orientation in each layer (or lamina) of the material. A number of such laminae are stacked to form a laminated composite material that can be used to build a structural component. Fibers for industrial uses are, in general, made of carbon, glass, aramid, or basalt. Based on the type of fiber material, the two most popular FRPs available and typically used in the industry are carbon-fiber-reinforced plastics (CFRP) and glass-fiber-reinforced plastics (GFRP), also known as fiberglass. A composite laminate is defined as the stacking of two or more unidirectional layers/plies/laminae with a uniform or varied fiber orientation with respect to a reference direction. The laminae can be made of the same material or different ones and can have individual thicknesses. The stacking sequence is essentially defined by the fiber orientation in each ply with respect to the first axis of the laminate coordinate system. Stacking sequence (0/45/90/45/0) of an antisymmetric balanced laminate. Analyzing a composite laminate can be rather challenging, as the geometric scale of fibers, plies, and laminates are quite different. That is the reason the complete analysis is performed at two levels or scales: micromechanics analysis and macromechanics analysis. 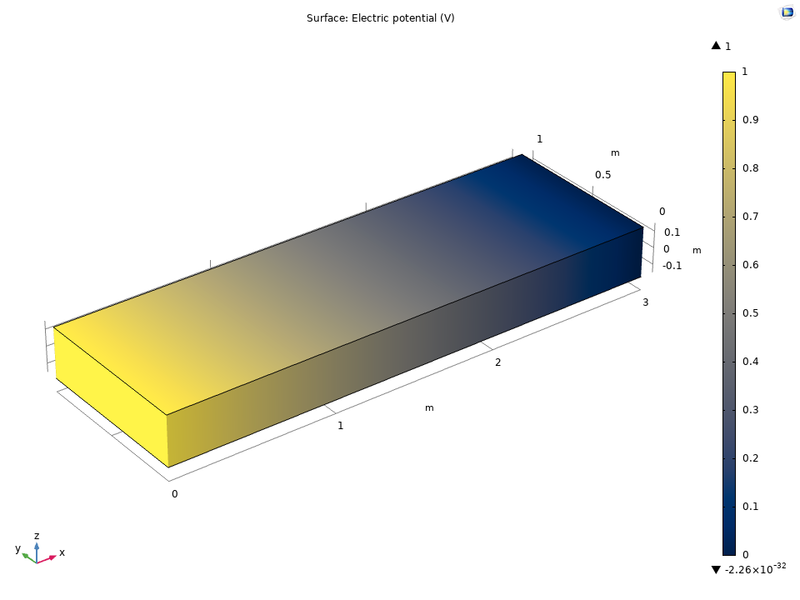 This step deals with simulating either a single lamina or a typical unit cell that has a fiber surrounded by a matrix. The purpose of this step is to calculate the lamina’s homogenized material properties. Representative unit cell of a fiber composite layer having a 60% fiber volume fraction. In COMSOL Multiphysics®, the micromechanics analysis is performed using the Cell Periodicity node in the Solid Mechanics interface. It needs a 3D solid geometry of a unit cell with a fiber and matrix along with their material properties. 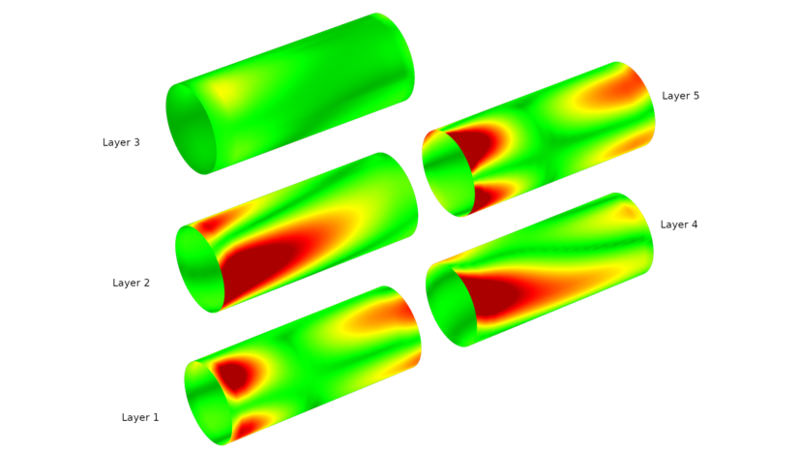 This analysis, which is based on a representative volume element (RVE) technique, is performed for six load cases and material data for a homogenized material is created. 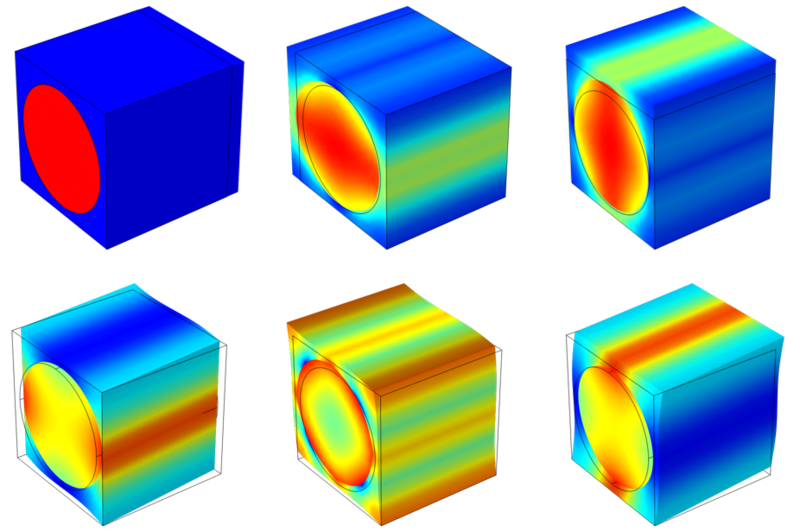 To find out more, see the Micromechanics and Stress Analysis of a Composite Cylinder example. 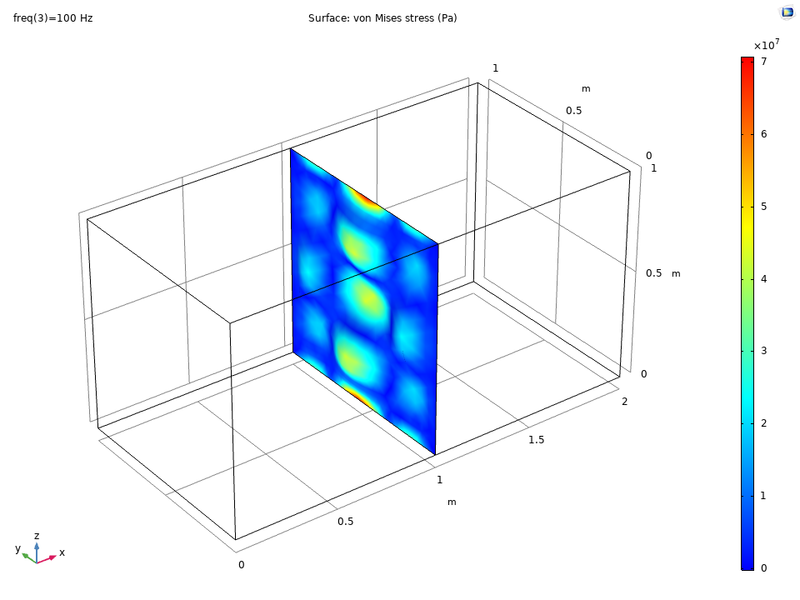 Von Mises stress distribution together with the deformation in a unit cell for six different load cases. This step deals with the modeling of a laminate that has many layers. The homogenized material properties of a lamina computed from the micromechanics analysis are used as input. The aim is to compute the response of a laminate under various loading conditions. Cross section of a composite laminate showing the thickness and fiber orientation of each layer. To define the laminate properties discussed above in the Composite Materials Module, a Layered Material node is used. In this node, the required number of layers can be added, and inputs can be either directly entered in the table or loaded from a text file. Once the inputs are specified, it is possible to preview the cross section as well as the stacking sequence of the laminate. The Layered Material node, containing the laminate definition, can be saved in the material library and loaded at a later point in time. Example of a Layered Material node. Once the laminate is defined using the Layered Material node, it can be attached to the geometric boundaries through the Layered Material Link or Layered Material Stack node. While doing so, the laminate coordinate system as well as the position of the geometric surface with respect to the laminate are also defined. The laminate coordinate system is further used to interpret the stacking sequence and create a layerwise local coordinate system. 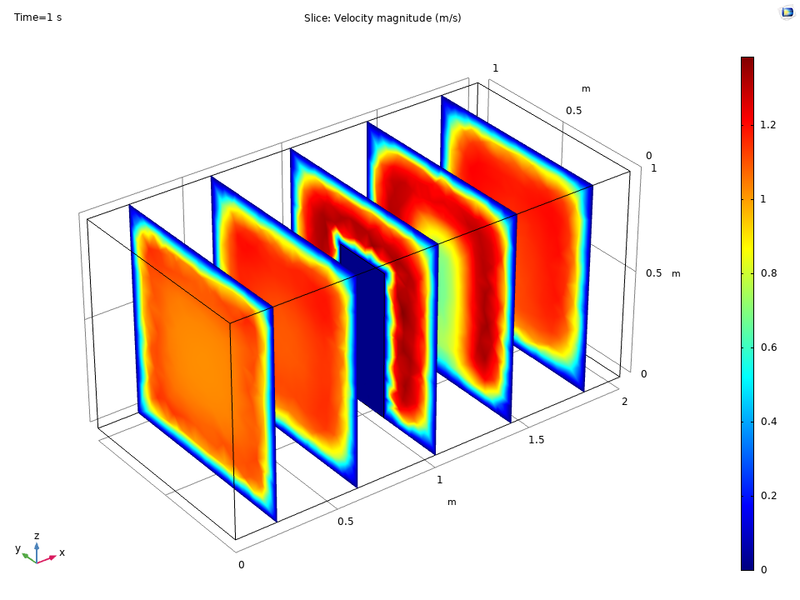 In COMSOL Multiphysics, ESL-FSDT and the layerwise theory are implemented. In ESL-FSDT, homogenized material properties of the entire laminate are computed and equations are solved only at the midplane. 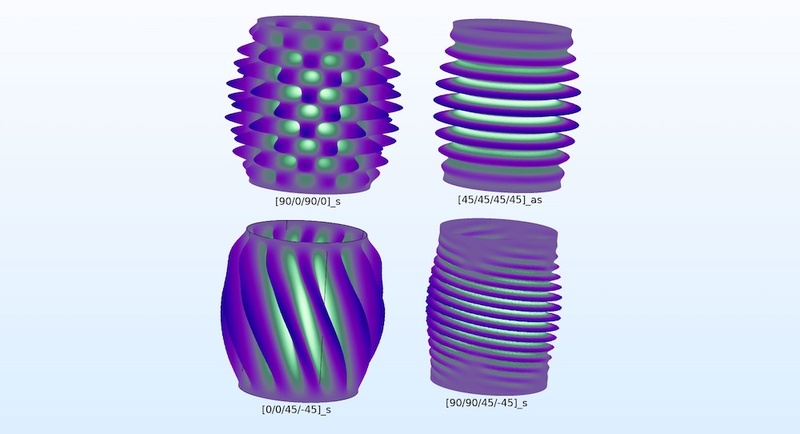 This theory has a shell-like formulation with degrees of freedom (DOFs) in the form of three displacements and three rotations on the meshed boundary in 3D. This theory is suitable for thin to moderately thick laminates and can be used for finding the global response as gross deflections, eigenfrequencies, critical buckling load, and in-plane stresses. Compared to the layerwise theory, ESL-FSDT is computationally inexpensive; however, it requires a shear correction factor for thicker laminates. In this theory, equations are solved also in the thickness direction; hence, it can be used for very thick laminates, including delaminated regions. This theory has a solid-like formulation with DOFs in the form of three displacements distributed also in the thickness direction. This theory is suitable for moderately thin to thick laminates and can be used to predict correct interlaminar stresses and delamination and to perform detailed damage analysis. It supports nonlinear material models and doesn’t require a shear correction factor, as opposed to ESL-FSDT. 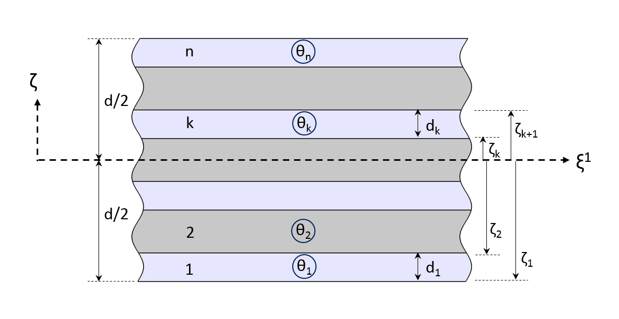 DOF nodes in the layerwise theory. Based on the above descriptions, a suitable laminate theory can be chosen. A simple rule of thumb is to choose a laminate theory based on the laminate aspect ratio, which is defined as the ratio of laminate length to the laminate thickness. Range of validity for the two laminate theories based on the laminate aspect ratio. 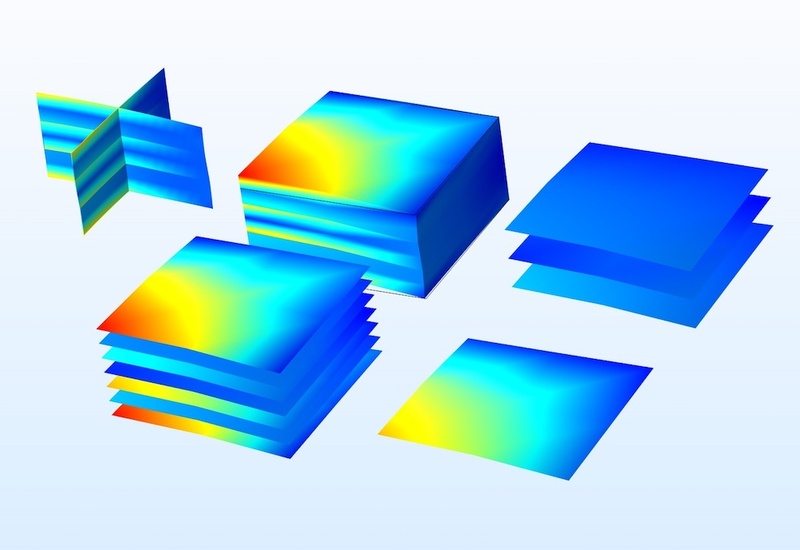 In COMSOL Multiphysics, composite laminates are analyzed either using the layerwise theory through the Layered Shell interface or using ESL-FSDT through the Layered Linear Elastic Material in Shell interface. Salient features of the Layered Shell and Shell interfaces are described below. 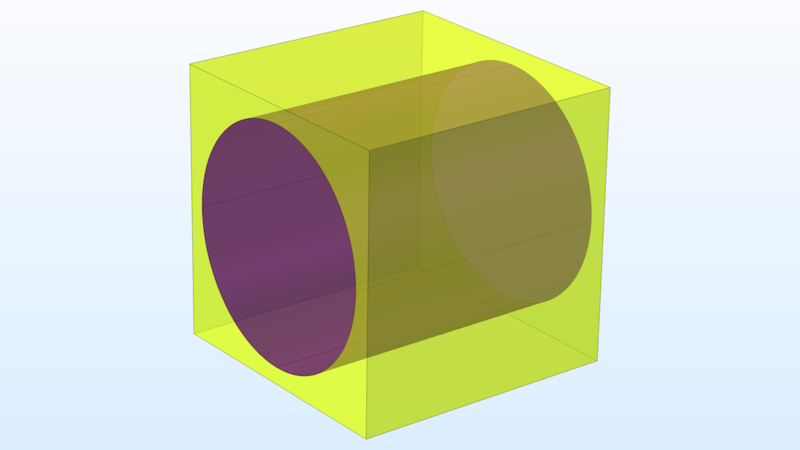 The quadratic-linear shape is intended for faster simulation results, whereas the quadratic-cubic shape is good for more accuracy in through-thickness results. The mixed shape discretization elements in the Layered Shell interface. The Layered Shell interface allows you to join two laminates placed next to each other using the Continuity node. 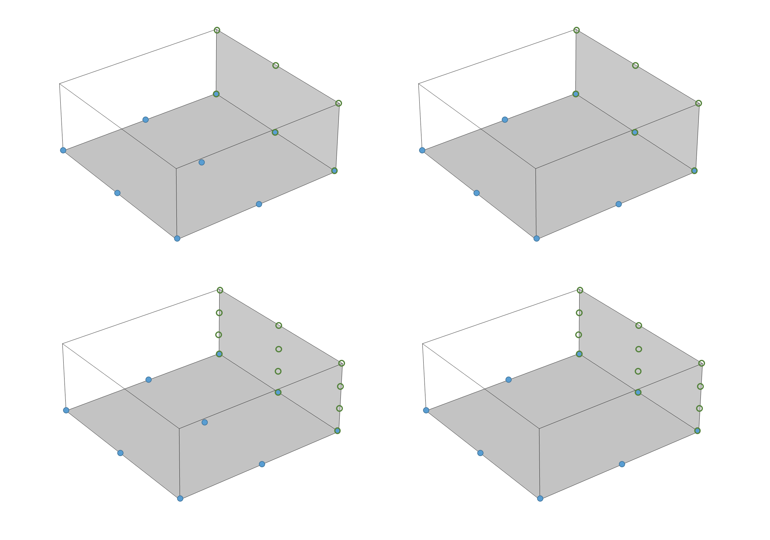 With this functionality, you can model a ply drop-off scenario. 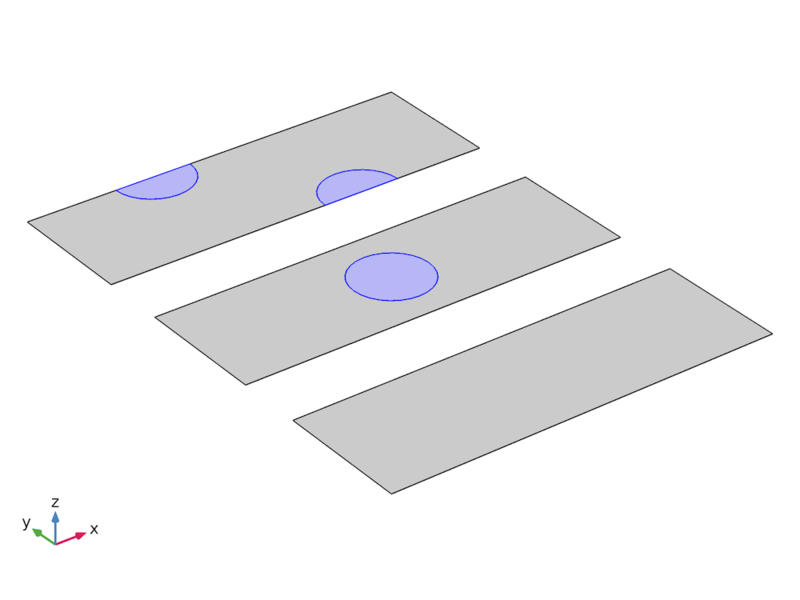 Different ways of setting up the continuity between two laminates placed side-by-side. It is possible to include nonlinear material models (for example, viscoelasticity, creep, and viscoplasticity) in a few or all of the layers of a laminate. This functionality is available in the Layered Shell interface. You can check out the Material Characteristics of Laminated Composite Shell example for more details. As the geometry contains only surfaces, the Layered Material dataset is used to display the results of the simulation on a geometry that has a finite thickness. With this dataset, you can increase or decrease the laminate thickness in the normal direction, which is useful for thin laminates. In addition, you can create surface plots, volume plots, slices plots, etc. in 3D. Various plots created using the Layered Material dataset. 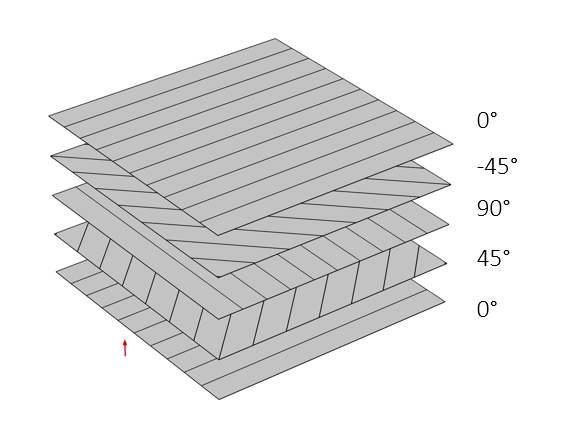 Von Mises stress in the middle of each layer of a laminate, created using the Layered Material Slice plot. This plot is used to determine the variation of different quantities through the thickness of the laminate. You can choose one or several geometric points on the boundary. You also have the option to create a dataset of the cut points as well as to directly enter the point coordinates. 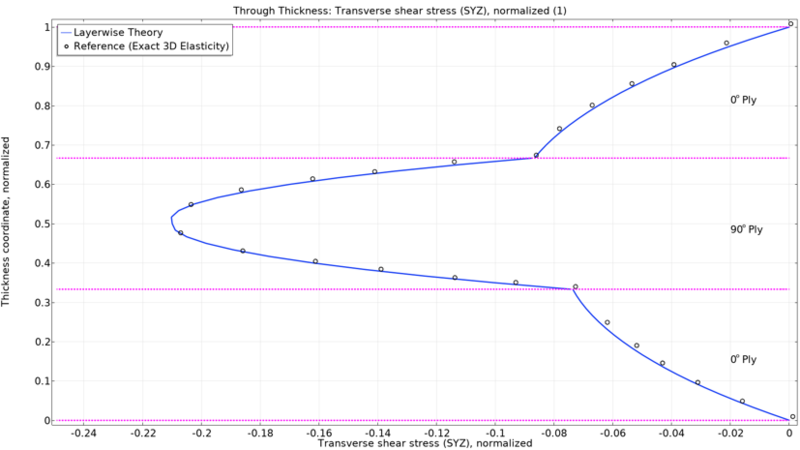 Through-thickness variation of the transverse shear stress at one point in a laminate. A first-ply failure analysis is possible in both laminate theories. It is performed using the Safety node under the Linear Elastic Material node. A number of failure criterion are supported; e.g., Tsai-Wu, Tsai-Hill, etc. You can refer to the Failure Prediction in a Laminated Composite Shell example for more details. 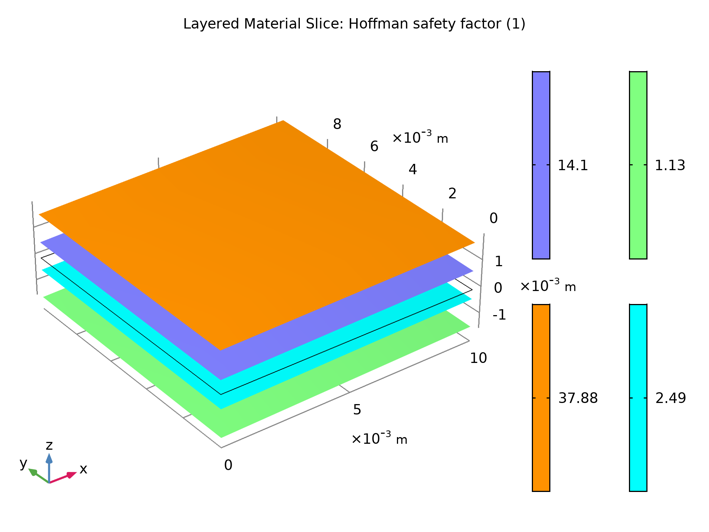 Hoffman safety factor in different plies of a laminate. Linear buckling is possible in both laminate theories; however, ESL-FSDT is more efficient in finding the critical buckling load factor as compared to the layerwise theory. It is possible to optimize a layup in order to maximize the critical buckling load. For more information, see the Buckling of a Composite Cylinder example. Example of the buckling of a composite cylinder. The four different mode shapes (diamond, axisymmetric, and two spirals) corresponding to different stacking sequences are shown. Delamination modeling is possible using the layerwise theory. The Thin Elastic Layer, Interface node is used to model the delaminated zone. 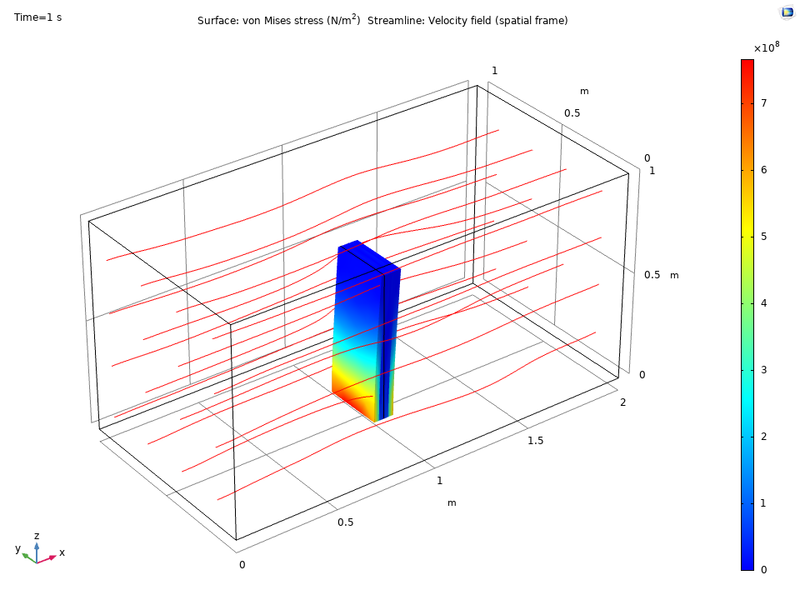 To learn more, check out the Forced Vibration Analysis of a Composite Laminate example. Left: Composite laminate with and without a delaminated region. 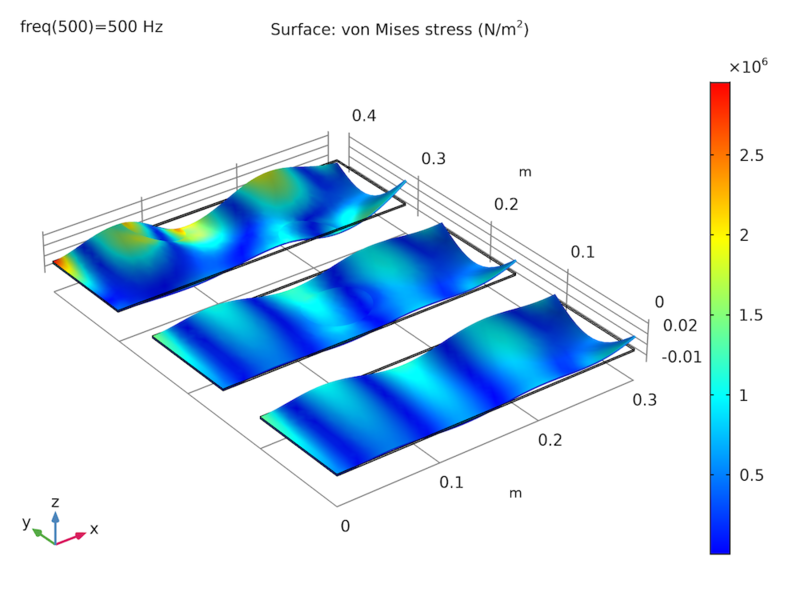 Right: Von Mises stress distribution at 500 Hz when subjected to a bending load. Example of Joule heating and thermal expansion in a composite laminate. Left: Electric potential. Middle: Temperature distribution. Right: Von Mises stress distribution. 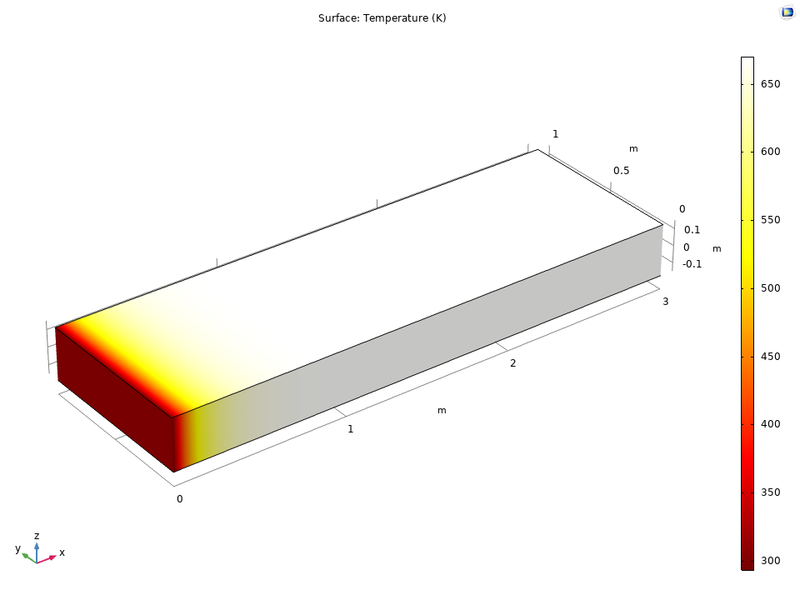 You can refer to the Thermal Expansion of a Laminated Composite Shell example for more details. The Acoustic-Structure Boundary multiphysics coupling node is used to define the interaction between the two physics. 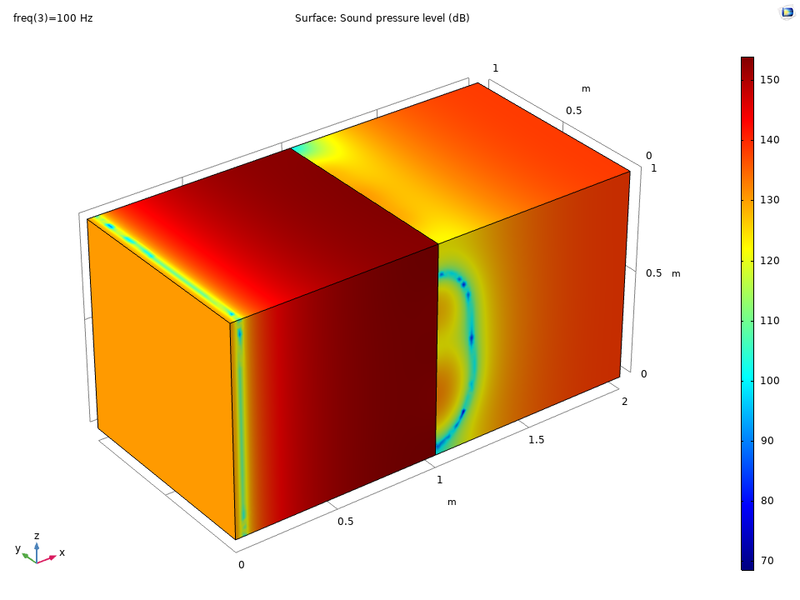 Example of an acoustics-composite interaction. Left: Sound pressure level in the air domain. Right: Von Mises stresses in a composite plate. The Fluid-Structure Interaction multiphysics coupling node is used to define the interaction between the two physics. Example of a fluid-composite interaction. Left: Velocity magnitude of the fluid flow. Right: Von Mises stresses in a composite plate. 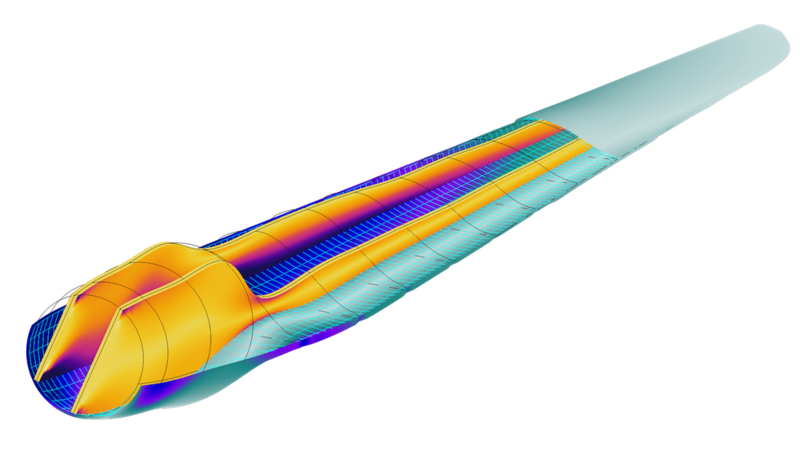 Using the abovementioned functionality, a wind turbine composite blade is modeled. The blade considered here is 61.5 m long and the geometry has 19 different sections that are defined by airfoil shapes. The aim of the analysis is to find the stress distribution in the skin and spar under gravity and centrifugal forces. Also, the natural frequencies and mode shapes are computed at different speeds. Example of a wind turbine composite blade. 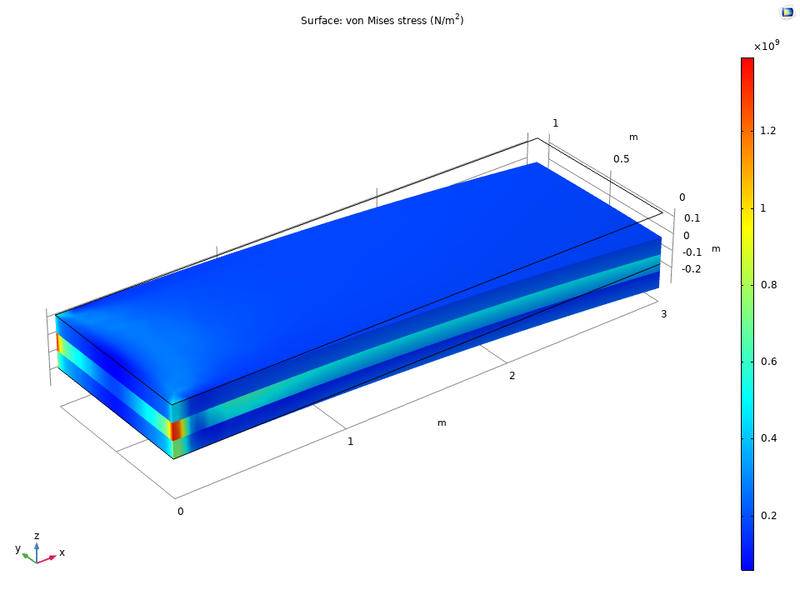 The von Mises stress distribution in the skin and spar of the blade is shown. To try this example yourself, see the wind turbine composite blade model. Find out more about the dedicated functionality for modeling composite structures in the Composite Materials Module. Contact COMSOL via the button below to evaluate the software. 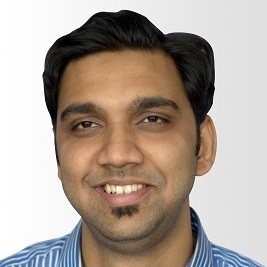 This is dhanunjay, I am doing micromechanics analysis by representative volume element method and periodic boundary conditions for the fiber of circular and elliptical cross-sections. I am able to perform both separately for different cross-sections if I try to solve in a single file by taking another component and all it is showing only one result and unable to connect the compared graphs between them. 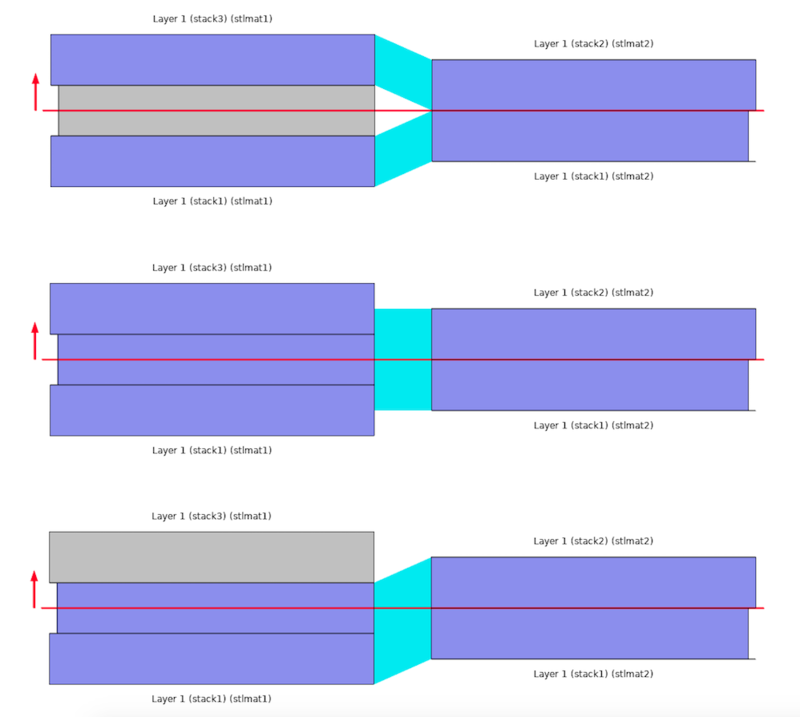 But I want both cross-sections to be done in a single file and also need to show the comparison in the form of graphs for the fiber volume fraction and material constants. So in this context, I am seeking your help in performing both RVE models in single file and need comparisons. I hope a positive reply from you. Thanking you very much. This is my mail id dhanunjayborra@gmail.com and you can send a reply to mail id also. If you want I can send .mph file also. Thank you. 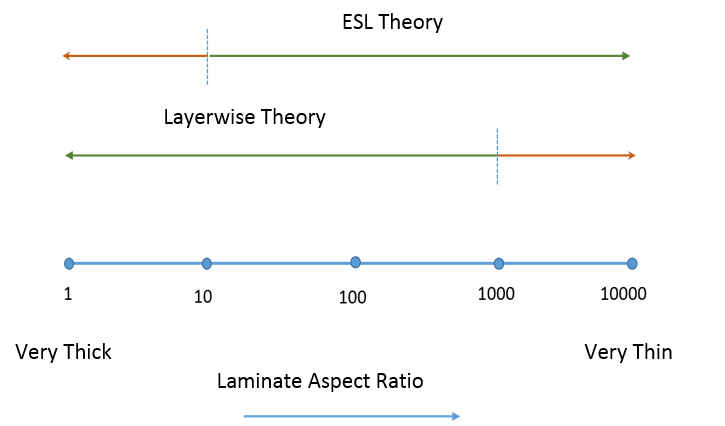 It is possible to solve for two or more RVE models in a single file but in different components. The only limitation for now is that the homogeneous material created under global definition corresponds to any one of the RVE models. Apart from that, you can plot or derive any quantity from all the RVE models.